An exquisite brick exterior wraps this stately traditional home in luxury, while its hipped and gabled roof add stature and elegance. An impressive two-story ceiling with clerestory dormers amplifies the great room with fireplace, built-ins, and access to the back porch. An enviable center island kitchen is open to the great room and bayed breakfast area for optimum togetherness. 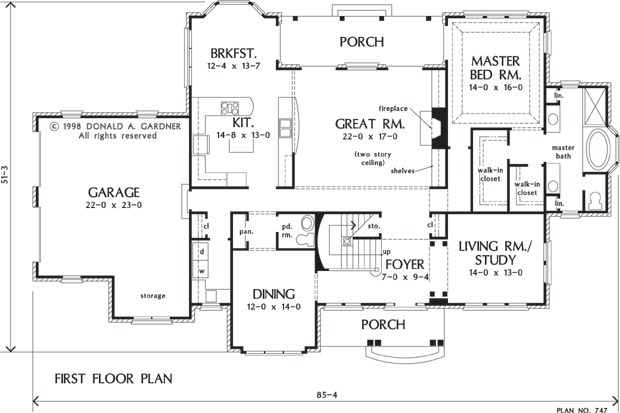 Topped with a tray ceiling, the master suite enjoys back porch access, dual walk-ins, and a luxurious bath. Upstairs, a balcony overlooks the foyer and great room. Two upstairs bedrooms feature vaulted ceilings, while a third boasts a private bath. Another hall bath, ample linen space, and a bonus room finish the second floor. 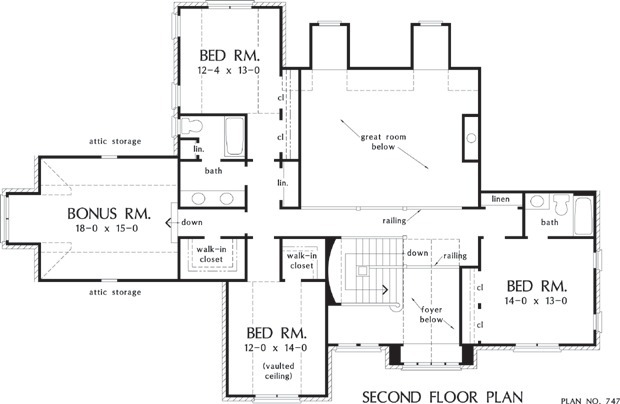 1st Floor: 2372 Sq. Ft.
2nd Floor: 1111 Sq. Ft.
House Dimensions: 85' 4" x 51' 3"
Great Room: 22' 0" x 17' 0"
Bonus Room (Vaulted): 18' 0" x 15' 0" x 9' 0"
Garage Storage : 10' 11" x 6' 0" x 0' 0"
Bedroom #2 (Vaulted): 12' 4" x 13' 0" x 11' 9"
Bedroom #3 : 14' 0" x 13' 0" x 9' 0"
Bedroom #4 (Vaulted): 12' 0" x 14' 0" x 13' 0"
Porch - Front : 18' 1" x 5' 7" x 0' 0"
Porch - Rear : 23' 5" x 7' 2" x 0' 0"
Living Room : 14' 0" x 13' 0" x 9' 0"
Balcony : 22' 0" x 3' 8" x 0' 0"
Storage (1st Fl.) : 4' 8" x 3' 4" x 0' 0"
Foyer (Cathedral): 7' 0" x 9' 4" x 25' 2"
Great Room (2 Story): 22' 0" x 17' 0" x 19' 0"
Kitchen : 14' 8" x 13' 0" x 9' 0"
Breakfast Room : 12' 4" x 13' 7" x 9' 0"
Utility Room : 5' 8" x 9' 2" x 9' 0"